Cluster munitions: do not adjust your set? NPT newsflash - Bingo! Game On! The NPT: Here we go again? Can global warming be a trigger for conflict? Regular visitors to this site will have noted that over the last month or so our blogging has focused on two important multilateral meetings - the preparatory meeting of the nuclear Non-Proliferation Treaty in Vienna and, more recently, a meeting of the Oslo Process in Lima, Peru, which is working to address the humanitarian impacts of cluster munitions. I would have been in Peru blogging to you personally, dear reader, but for a meeting of our own near Geneva, hosted as part of the work of the Disarmament Insight initiative to help multilateral disarmament practitioners think out of the box. On Friday 25 May, around 25 invited disarmament diplomats at both ambassador and working level, experts from United Nations agencies and the International Committee of the Red Cross (ICRC), researchers, civil society representatives and the Disarmament Insight team met for a one-day symposium on the themes of "Human security, 'human nature' and trust building in negotiations". - Frans de Waal, Director of the Living Links Center and C.H. 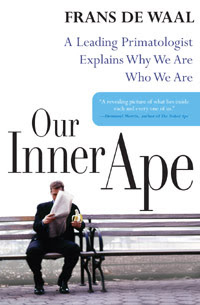 Candler Professor of Primate Behaviour at Emory University, who explored what multilateral practitioners can learn from our closest relatives in the animal kingdom, including the chimpanzee and the bonobo, about negotiating and the nature of aggression and reconciliation. Frans was recently named by Time magazine as one of its 100 people shaping the world in 2007. - Paul Seabright, Professor of Economics at the University of Toulouse and author of "The Company of Strangers: a Natural History of Economic Life", who analysed the interactions between our minds and our institutions in modern life, which may help us to understand better why in some contexts conflict seems so intractable. - Dr. Robin Coupland, the ICRC's adviser on armed violence and the effects of weapons and a former war surgeon, who discussed how de Waal's and Seabright's views tie into understanding armed violence. - Yours truly. I talked briefly about the notion of 'cognitive ergonomics' - of looking at multilateral negotiating processes and how we could better design them to leverage our cognitive and social skills as human beings. The emphasis of the symposium was on informal discussion and it followed the Chatham House rule. While respecting that rule, we'll be posting more information about the symposium here, including pod casts of some of the presentations, over the coming weeks. So check back regularly for some fresh ways of "thinking differently about human security" from what was a productive gathering of big-brained social apes. Info about the ICRC's work on weapons and humanitarian law is available here. Disarmament Insight note – although the world's biggest producers of cluster munitions - the United States, Russia and China - are still not among them, delegates from 68 countries met late last week in the Peruvian capital, Lima, to broaden support for a declaration agreed to in Norway in February calling for a ban on cluster bombs by 2008. More than a third joined the process for the first time, having missed the Oslo meeting. The post below from our guest blogger Jamie Stocker reports on the final day of the Lima Conference and offers some concluding thoughts. Many predicted issues about how to define key terms for an international humanitarian instrument on cluster munitions to be the most contentious for the Lima Conference. With these rescheduled from Friday morning to Thursday (see previous posts) and now out of the way, the final day of the Lima Conference was more relaxed in tone, with transparency, compliance and procedural issues scheduled for talks before the closing ceremony. Most delegates agreed that the transparency measures developed for the 1997 Anti-Personnel Mine Ban Convention should generally be taken as a model for a cluster munitions treaty (although it was noted that certain improvements could be made). The NGO Cluster Munition Coalition (CMC) made several suggestions in this regard, such as provisions requiring national reports to be made public. It also suggested that states consider making the disclosure of information regarding past use of cluster munitions mandatory, if it would help with ongoing clearance efforts. Compliance measures were also discussed, including domestic penal sanctions for treaty violations. Talks also covered the number of accessions by states for any treaty agreed to enter into force internationally. The Mine Ban Convention required 40 signatures, while the fifth protocol of the Convention on Certain Conventional Weapons (CCW) on explosive remnants of war required only 20. NGOs, predictably, pushed for a low threshold – of 20 – but others, such as the Netherlands, questioned this. Other issues will also have an impact on the effectiveness of any treaty on cluster munitions. One challenge will be in determining how to coordinate humanitarian efforts to deal with cluster munitions, mines, and other explosive remnants or war: because there are three different treaties dealing with these related subjects doesn’t necessarily mean that there need to be three different forums and institutions to address these problems. This withstanding, some aspects of any treaty on cluster munitions, notably clearance and international assistance, will need to be coordinated in order to ensure that resources are devoted to the most pressing needs on the ground. This same logic extends to a variety of other areas of the treaty, including the need for regular meetings. In this regard, many delegates observed how useful an implementation and support unit for the Mine Ban Convention has been, and it’s likely that this kind of unit would be useful for implementing a future cluster munition treaty. But aspects of its work would be quite different in the case of cluster munitions. Among other areas, different information on stockpiles, destruction and other areas of implementation will be required. Further thinking seems to be needed here, not least as work in the Oslo Process evolves and the requirements of an international humanitarian instrument to deal with the humanitarian impact of cluster munitions becomes clearer. Most delegates at Lima I spoke with came away from the Conference with the impression it was a success. Not only had a variety of issues been discussed in a productive manner, virtually all states there expressed commitment to reaching a treaty in one multilateral configuration or another (Oslo Process and/or the CCW). It feels like a long time until early December and the next round of the work of the Oslo Process in Vienna. In the meantime, there are a few days of CCW experts’ talks in Geneva in June and its Meeting of States Parties in November. It is unclear what progress the CCW will make, although some states in that forum are pushing for a negotiating mandate on cluster munitions. At Lima, some of these same states – who are in favour of more limited restrictions on cluster munitions – largely avoided engaging in substantial debate about the shortcomings of submunition self-destruct mechanisms and the testing of failure rates, which are nevertheless key elements of the rationales behind their postures. The hope expressed by some in the Oslo Process is that the International Committee of the Red Cross’s (ICRC) Montreux Expert Meeting report due to be released shortly will prompt more direct engagement (John Borrie attended Montreux: see his post of 24 April for more details). Indeed, in the last minutes of the Lima Conference, the ICRC noted that the burden of proof is shifting to those who defend these technical approaches to show that those proposals are capable of addressing the humanitarian impacts cluster munitions cause. Meanwhile, the Oslo process won’t stand still. At Lima, states announced initiatives to hold regional meetings in Latin America, Africa and possibly Eastern Europe. Peru announced that it would work towards a regional cluster munition-free zone. Hungary received a round of applause from NGOs and others on Wednesday when it announced that it would destroy its existing stockpiles of cluster munitions soon, demonstrating the ongoing value of national action from individual states. New Zealand announced it will host a round of the Oslo Process in Wellington from 18 to 22 February 2008. Disarmament Insight will continue to follow these issues, so check in regularly. This is a guest blog from James Stocker. Jamie is a researcher on UNIDIR’s project on “The humanitarian impacts of cluster munitions: practitioners’ perspectives”. For more information about the Anti-Personnel Mine Ban Convention, visit the Geneva International Center for Humanitarian Demining's Implementation Support Unit website. The ICRC expects to have its summary report of the Montreux meeting available in early June. It can be downloaded from the ICRC website. Photo retrieved from Human Rights Watch,© 2006 UN Mine Action Coordination Center for southern Lebanon. Disarmament Insight note – although the world's biggest producers of the munitions - the United States, Russia and China - are still not among them, delegates from 68 countries met late last week in the Peruvian capital, Lima, to broaden support for a declaration agreed to in Norway in February calling for a ban on cluster bombs by 2008. More than a third joined the process for the first time, having missed the Oslo meeting. The post below from our guest blogger Jamie Stocker reports on the second day of this meeting: reporting on the Lima Conference’s final day will follow soon. The second day of the three-day Lima Conference began with talks about storage and stockpile destruction of cluster munitions. Though the majority of delegates expressed support for the destruction of banned weapons as soon as possible, others thought it necessary to allow more time, as well as renewal periods for states “unable” to destroy their stockpiles within the set deadlines. Why the controversy over this seemingly mundane, technical issue? Part of the problem is, well, technical. Many speakers acknowledged that the destruction of cluster munitions stockpiles is generally more complicated than, say, anti-personnel mines. Whereas many types of land mines can basically be stacked in a pile, lined with explosives and blown up (PLEASE don’t try this at home, kids), cluster munitions must often be disassembled and individual explosive submunitions destroyed separately. Financial considerations also come into play. More “technical” disposal is likely to be more expensive, though exact figures aren’t available. In this regard, more expert input will be necessary down the road – Belgium noted that its experience in destroying its stockpiles could be useful. Some states were also frank about another “financial” aspect: the costs of replacing prohibited cluster munitions with other types of weapons to perform missions that militaries currently use cluster munitions for. Others labeled this as a ”national security” rather than a security issue. Implicitly, this allows for the possibility of continued cluster munition use (at least, within this time frame) – precisely what this process is trying to prevent. All delegations seemed to agree on the need for international cooperation, including developing countries, many of which took the opportunity to discuss their own problems with land mines and explosive remnants of war (ERW). This issue is relatively uncontroversial for the moment. But it’s likely to require coordination with other instruments that already address international cooperation in related areas, including the 1997 Anti-Personnel Mine Ban Convention and the 2003 Protocol V of the Convention on Certain Conventional Weapons (CCW). Lunchtime was filled with discussion about what the afternoon definitions debate would bring (see previous posts). At its outset, the session co-chair wisely cautioned against getting hung up on the differences between regulating and prohibiting certain types at this point, but to rather have a discussion of the issues surrounding unacceptable harm. However, this distinction turned out to be uncontroversial, since a number of states that have been assumed to support a more limited restriction (such as the United Kingdom, France and the Netherlands) made it clear that they were here to ban a certain class of weapon. Nor did these delegations draw any “red lines” on weapons they’d like to keep, though they and a number of others insisted on the relevance of self-destruct mechanisms and failure rates for these discussions. No one disputed this point, though several states and the Cluster Munition Coalition (CMC) did note that evidence is lacking to show that these devices are capable of preventing humanitarian impact. The CMC suggested that the burden of proof was now on states to prove that these weapons were not and could not be harmful, rather than the other way around. Definitions, of course, aren’t just limited to that of cluster munitions themselves. As several delegations, including Germany, pointed out, other terms may need discussion, such as submunitions, victims, assistance, etc. The German draft proposal to the CCW, for instance, contains 13 different definitions, while the Lima draft discussion text only had one. However, it might be asked if some concepts need to be defined, or whether they could left out of the text altogether. “Dangerous duds”, for instance, was considered by some to be a “dangerous definition” that could lead to the false impression that some duds are actually safe. Too bad that the International Committee of the Red Cross (ICRC)’s report on its April Montreux meeting of experts wasn’t out in time for this week’s meeting (see John Borrie’s blog from 24 April). Although this meeting reached no outcomes, its report may shed light on these definitional issues in time for the CCW June expert meeting in Geneva. Picture of PTAB submunitions piled up near Bagram, Afghanistan, in 2002. These were part of a munition dump containing 60,000 tons of unexploded ordnance. Image courtesy of John Rodsted and Norwegian People's Aid. Downloaded from Norwegian People's Aid. The Lima Conference on cluster munitions got off to a solid start this morning with a presentation by Cluster Munition Coalition (CMC) representative Branislav Kaperanovic, a Serbian former clearance worker and cluster munition victim who expressed his hope for broadening support for the Oslo Process. Representatives of two countries affected by cluster munitions, Lebanon and Cambodia, then took the podium in succession. Neither are producers or users of cluster munitions, yet both are among the most heavily affected countries in the world. All of these speakers sounded notes of urgency about the need to deal with the effects of cluster munitions at the international level, knowing firsthand their effects. Peru, the Conference chair introduced the programme of work for the three-day meeting, which will revolve around thematic discussions. But springs began popping out of the sofa when France proposed that discussion of “general obligations, scope of application and definitions”, which was scheduled for Friday morning, be discussed much sooner. Over the next 45 minutes these comments were echoed by a number of (mostly European) states keen to move discussion of definitions ahead of what they considered “less important” issues such as victim assistance, clearance, storage and stockpile destruction, and transparency. However, this proposal encountered resistance from other present, especially developing and affected countries, as well as other states closely associated with the Oslo Process. One of them, Austria, proposed a winning compromise: switch the Friday morning discussions for those scheduled for Thursday afternoon. Why all this fuss over when to discuss definitions and obligations? Those arguing for the change argued that the Lima Conference should make it clear from the beginning exactly what weapons were being discussed in the context of regulation of prohibition. Earlier Disarmament Insight posts have noted that a key issue for any international instrument to address the humanitarian impacts of cluster munitions is that of defining exactly what will be regulated or prohibited, not least because a very broad definition could go well beyond the comfort zones of many. Fair enough. But this concern can detract from a broader point (and underlined earlier in the morning by Cambodia) that the Conference has the task of working toward addressing “both existing and potential suffering” associated with these weapons. These go beyond issues of regulation to measures to dispose of unexploded submunitions and assist victims, for example. So many eyes rolled when the view was put forward implying these are just downstream issues. Another inevitable talking point concerned the relationship between the Oslo Process and the Convention on Certain Conventional Weapons (CCW). Though a few states expressed a preference for negotiating in one forum over the other, the majority expressed their support for whichever forum could, in practice, address the issues at hand in an effective manner. On the whole, it was a long day. But spirits remain positive: a successful compromise on a small change in schedule that nevertheless reflected a big point was negotiated. And, on substantive issues, a lot of common ground was recognized. Check in over the next few days for further impressions of the Lima talks, including on stockpile storage and destruction, as well as on the “dangerous definitions” discussions. The Lima Conference Chair’s discussion text can be downloaded in English and Spanish from the Cluster Munition Coalition’s website at: http://www.stopclustermunitions.org. 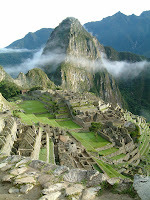 Photo of the Machu Picchu, the "Lost City of the Incas" (retrieved from Wikipedia). I'm Jamie Stocker and, over the next few days, I’ll be posting updates on the progress of the international conference I’m attending in Lima, Peru, on cluster munitions, which starts today and finishes on Friday. This conference follows the Oslo Conference held in February (see previous posts) and seeks to both broaden support for its goals and deepen discussions on “cluster munitions that cause unacceptable harm to civilians”. Yesterday, the Cluster Munition Coalition (CMC) hosted a Regional Civil Society Forum in Lima on “Taking Action On Cluster Munitions”, which I attended as an observer. This forum had several goals, including trying to set the tone for the Lima conference of states, attracting media attention (including from what I have been told is a very interested Peruvian media), countering arguments against efforts to address through regulation or prohibition the humanitarian impacts of cluster munitions, as well as outlining the CMC’s “expectations” on what it wants to see come out of the Oslo process. Unfortunately, there isn’t space in this short post to give a comprehensive overview of the day’s proceedings. Among those speaking at the Forum, however, were Nobel Peace Prize laureate Jody Williams and Peruvian Ombudswomen Beatriz Merino. Rae McGrath of Handicap International began the morning English language session with a discussion of the clusters issue, driving home a point about the indiscriminate effect of cluster munitions by “scattering” a handful of (thankfully unused) teabags from the breakfast room among the audience. Further highlights included two further statements read on behalf of Nobel Peace Prize laureates. In the first statement, South African Anglican Archbishop Desmond Tutu called on African states to play a leading role in the clusters munition campaign, noting that while African nations had been heavily involved in the process leading to the mine ban (Ottawa) treaty, only 4 of 47 signatories of the Oslo Declaration were from Africa. The second statement on behalf of a group of six women Nobel Peace laureates praised the Oslo Process’s efforts to address “these especially pernicious weapons of ill repute” (crediting Steve Goose of Human Rights Watch with coining this phrase). This list of supportive Nobel Peace laureates was later further expanded, as a Costa Rican representative underlined the support of President Oscar Arias, who received the prize in 1987 for his efforts to end conflicts in several Central American countries. Beyond political statements, those present also got down to looking at aspects of the issues surrounding cluster munitions in some depth, and there were presentations by a number of experts and NGOs. Many of these talks were sophisticated in dissecting the types of arguments used for the continued military utility of cluster munitions (for instance, see Human Rights Watch’s document, “Myths and Realities about Cluster Munitions” – reference below. See also their short film embedded in this post.) Moreover, some seemed to directly address elements of various proposals and discussion papers circulated at the ICRC meeting in Montreux in April and the Convention on Certain Conventional Weapons (CCW) informal meeting in Geneva last week. The Forum was also an unprecedented opportunity to discuss cluster munitions in the Latin American regional context, including confirmed or alleged use of this weapon in several countries. On the whole, the presenters were well-organized and expressed conviction and clarity of purpose. It will be interesting to see to what extent states attending the Lima Conference follow this example as they move to address these issues over the next days and months. The Oslo Declaration can be downloaded here. Human Rights Watch, “Myths and Realities about Cluster Munitions”: http://www.hrw.org/campaigns/clusters/myths0307/. Human Rights Watch, short film on cluster munitions available on Youtube: http://www.youtube.com/watch?v=TpGMiAlVM6g. More information about UNIDIR’s project on “The humanitarian impacts of cluster munitions: practitioners’ perspectives” is at: http://www.unidir.org/bdd/fiche-activite.php?ref_activite=339. Last Friday, in our last Disarmament Insight post, Patrick Mc Carthy noted the launch of a report by the non-governmental organisation (NGO) Handicap International (HI) entitled “Circle of Impact: The Fatal Footprint of Cluster Munitions on People and Communities”. It follows Handicap International’s preliminary report about the socio-economic effects of cluster munitions, “Fatal Footprint: The Global Human Impact of Cluster Munitions,” released in early November 2006. To briefly recap, “Fatal Footprint” identified 11,044 casualties (3,830 killed, 5,581 injured) directly related to cluster munition use in 23 countries and territories. 98% of these casualties were reportedly civilians. With 91% of such casualties occurring in countries with incomplete or zero data collection, it’s also highly likely that many casualties go unrecorded, HI noted. Authorities in only three of the 23 countries and territories in HI’s report collected data on casualties while in conflict. Moreover, many victims in high-use areas like Afghanistan and Cambodia go unreported altogether, and many others caused by unexploded submunitions aren’t differentiated from those caused by other explosive remnants of war. A lack of information about specific casualties caused by cluster munitions during or after strikes – like who was involved and what they were doing – is an issue for any comprehensive effort at casualty data collection. HI estimated that only about 10% of casualty information was available in its November 2006 report. In its more comprehensive “Circle of Impact” report released last week, HI “calls for a ban on cluster munitions and for assistance to civilians”. The total number of casualties it quoted as caused by cluster munitions rose to 13,306 (5,475 killed, 7,246 injured) in 25 countries and territories. The overall focus of the new report is on the civilian victims and the broader socio-economic challenges presented by cluster munition use during, and long after, conflict. Some country-specific recommendations of ways forward were offered, along with extensive data analysis. HI’s reports are cautious steps toward building a clear picture of what the effects of cluster munitions really are. It builds on useful work already done by other actors like the International Committee of the Red Cross, Landmine Action UK, Human Rights Watch and, indeed, UNIDIR. But as HI would be the first to admit, this picture is still very incomplete. HI’s press-pack distributed to journalists in Geneva last week to accompany its “Circle of Impact” report noted its launch “just one week before states gather in Lima, Peru (23-25 May), to discuss a draft text of a treaty to ban cluster munitions and create a framework for cooperation and assistance to survivors and communities affected by this weapon by 2008”. In public, HI and other NGOs are highly optimistic about the progress the Lima meeting will make in negotiating a treaty text to address the humanitarian impacts of cluster munitions. This needs to be taken with a grain of salt: while Peru, as chair of that meeting, has distributed a discussion paper containing a sample text of what a future instrument might look like, it seems unlikely that governments will have time to briefly discuss more than the broad themes of an agreement in just three days. More likely, negotiators won’t get down to textual brass tacks until later this year, either in Oslo in early December as the next chapter in the unfolding story of the “Oslo Process”, or (much less likely) in the context of the Convention on Certain Conventional Weapons in Geneva. Whatever the caveats necessary on “Circle of Impact” because of the limits of data gathering, the report’s real significance is in its timing. Emerging only days before the Lima meeting, HI’s work reinforces the message about the seriousness of the hazard created by cluster munitions – something that humanitarian practitioners have been trying to get through to the international community for a while. The “Circle of Impact” press release also notes that already such concerns have “resulted in at least 55 countries… taking initiatives towards a prohibition on cluster munitions.” This strikes me as premature. A lot is going to hinge on negotiators eventually defining what a cluster munition that causes “unacceptable harm” to civilians is in the terminology of the February 2006 Oslo Declaration (see previous posts). That’s ultimately a political question, despite legal and technical dimensions, and will need considerable skill to settle. Meanwhile, as the Lima meeting begins, some states participating recognise humanitarian concerns about cluster munitions and are willing to respond, but nevertheless view them as useful elements of their military arsenals. They don’t seem willing to give up cluster munitions with explosive submunitions entirely, at least not yet. Watch this space for updates about work in Lima. The final report, Circle of Impact: The Fatal Footprint of Cluster Munitions on People and Communities, and the HI Press Release are available here. 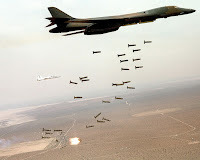 Photo of a B-1B Lancer unleashing cluster munitions (retrieved from Wikipedia). People who live and work in areas where cluster munitions have been used are only too familiar with the horrific humanitarian impact of this weapons system, both at the time of use and for long after the bombs have stopped falling. These are just some of the hard facts that will have to be faced by the governments gathering in Lima, Peru, on May 23-25 to take the first step along the path agreed in Oslo in February (see the May 15 and April 24 postings by John Borrie for background on the "Oslo process" on cluster munitions). The Oslo declaration does not - necessarily - foresee a complete ban on cluster munitions, but rather a ban on those cluster munitions that cause "unacceptable harm" to civilians. The Handicap International report has made it more difficult to claim that some cluster munitions cause harm that is "acceptable" in any humane sense of the word. To pass the muster of international humanitarian law, the military advantage to be gained from the use of a weapon must be proportional to the civilian casualties and damage to civilian objects caused by the attack. This notion of "proportionality," it seems to me, is closely related to the concept of "unacceptable harm" that will be at the heart of the Oslo process negotiations. Clearly, a 98 percent civilian casualty rate is neither proportional nor acceptable. It is also difficult to imagine what cumulative military advantage could be worth 400 million people living in daily fear of losing their lives or their loved ones. Photo by Dave Mitchell on Flickr - http://www.flickr.com/photos/davemitchell/279352521/. 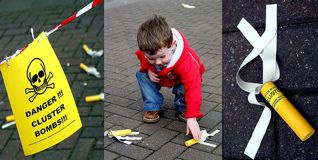 The photo is of a child picking up a fake cluster sub-munition at a Derry Anti-War Coalition demonstration (Northern Ireland). For the last couple of weeks, blog postings on this site have focused on the nuclear Non-Proliferation Treaty (NPT) with help from our guest blogger, Patricia Lewis. A very different meeting is to take place in Lima, Peru, next week about addressing the hazards of cluster munitions for civilians as part of the “Oslo Process”. It follows a groundbreaking conference of governments, as well as international organizations and civil society in Oslo, Norway, in February. More in coming postings about the Oslo Process. In the meantime, what does explosive submunition contamination actually look like in the field? We might imagine, for instance, that unexploded submunitions would be relatively easy to see, and thus avoid. After all, they’re not deliberately buried and concealed like landmines. So why should they be of special humanitarian concern? At the Oslo Conference, the humanitarian organization Norwegian People’s Aid showed all those participating this brief video clip by independent photographer John Rodsted of “cluster bomb duds that shouldn’t exist” in Southern Lebanon. The viewing had a chilling effect on all of those present in the conference room, an audience composed in large part of government representatives, as those watching realized that John was filming on Lebanese ground contaminated by submunitions that had failed to function correctly. Filming as he went, John literally walked among the hazardous M-85 duds to show how small and difficult to see they are – you can hear the nervousness in his voice. Looking for unexploded submunitions like this is not to be generally recommended (John has a great deal of experience in these situations, and was under the supervision of explosive ordnance disposal professionals). But it underlines why the input of civil society perspectives, and especially views from the field, are so important to keeping multilateral decision making real. A short video cut through acres of the usual conference room baloney of diplomats and politicians who have in many cases never even seen an unexploded submunition with their own eyes. It helped to give those present some clarity of purpose, which other multilateral meetings closed to the real world sometimes can lack. Reactions to the clip since it’s been posted on Youtube have been curious. A few viewers, of course, are unable to see beyond their tired prejudices, descending into infantile, aggressive and frequently misspelled ranting, and even claiming the video was faked. No mindset adjustment for them then. Others watching it were clearly unsettled. Judging from their comments the clip has challenged them, not least about cluster munitions but also possibly to think more deeply about what are legitimate means and methods of war. That’s an important question for every thinking person in the current age. Watch the video. What do you think? The Norwegian Foreign Ministry has an English language web page with the Oslo Declaration, statements and other resources about addressing the humanitarian impacts of civilians (click here to access this web page). Video clip by independent photographer John Rodsted of “cluster bomb duds that shouldn’t exist” in Southern Lebanon, available on Youtube at www.youtube.com/watch?v=v_jsyObTG8k. Friday was the day of the rushed endgame for the nuclear Non-Proliferation Treaty (NPT)’s troubled two-week first preparatory meeting in Vienna. Delays caused by deadlock over agreeing the meeting’s agenda during its first week (see previous postings) were felt more keenly on its final day than any other day since the agenda’s adoption. The substantive discussion, focusing on compliance and the right to withdraw, took place in the morning with a good set of substantive papers and some genuinely interactive debate. But until this debate had actually occurred, the meeting Chairman’s summary could not take it into account. Thus getting the nine-page – typo-free – factual summary out by 14h30 was truly a feat of efficiency on the part of the Chairman’s team and the UN secretariat. However, this of course meant that delegations had very little time to read the Chair’s summary and come to agreement on whether it could be annexed to the report of the PrepCom. So there we were at 17h45 (with the meeting due to end in 15 minutes) following intensive consultations with regional/political group leaders, Iran, the US and others, awaiting the outcomes of group meetings. The alternative available to the Chair – his fallback position – would be to remove paragraph 21 from the draft report (its reference to the factual summary) and deposit his factual summary as a working paper. Then we heard that Iran, along with Cuba, Syria and Venezuela, had threatened that they would only agree to adopt the report if the Chair agreed to not even table his summary. This was an unprecedented move and in the end it failed. Why were the “Fab Four” trying to block the Chair’s summary? Probably it was to do with the balance of the paper: in other words, Iran, along with North Korea and the nuclear weapon states (NWS) came in for a bit of stick. To me, the summary seemed to be just that – a summary of the discussions, without taking a strong political stance, and mild in criticism all round. The paper was particularly useful for those working on promoting a weapon of mass destruction free zone in the Middle East (coincidence? Perhaps not). Others, however, felt that it was too gentle on the NWS and too hard on Iran as well as those outside the Treaty, especially on North Korea. However, as luck and Austrian business life would have it, the conference room was booked for another event in the evening and so the traditional UN-spinning-things-out-until-midnight option was not available to NPT delegations. For reasons still unclear to me, the “Fab Four” backed down and allowed the report to go through, without the Chair’s Summary text directly attached but instead as a listed working paper. So in the end the NPT had a successful outcome, although it wasn’t easy. All those delegation that bit their tongues and allowed silence to prevail over fury are to be strongly congratulated. As is Ambassador Amano, the Chair, along with his (very large) team of experts and the UN secretariat – all of whom kept focused on achieving a result throughout the tricky two weeks – thus strengthening, not weakening, the NPT. This is a guest blog from Dr Patricia Lewis. Patricia is Director of UNIDIR. Text of NPT Chairman Amano’s factual summary paper can be viewed, along with more analysis, at the Acronym Institute’s website (www.acronym.org.uk). In due course, we anticipate that the UN’s official webpage on the NPT preparatory meeting will be updated with downloadable copies of its final documents: www.un.org/NPT2010. Things are in full swing at the nuclear Non-Proliferation Treaty (NPT) preparatory meeting in Vienna, and the atmosphere has changed completely. Interventions are constructive and chock full of ideas, information and proposals for ways forward. It may be only a temporary spurt, but this boat has all its sails up and a spinnaker at full wind. By Friday we may be back in the storm and heading for the doldrums as the delegations grapple with how to finalise the report, but for now everyone is enjoying the steady, sunny breeze. Both on its own behalf and as part of the reinvigorated New Agenda Coalition (NAC), South Africa has often taken the helm – witness their save-the-day proposal that resulted in the “asterisked agenda” (see previous postings for details). Today, along with two excellent papers, South African Ambassador Abdul Minty announced to the room that today was the Chairman’s birthday. Well, after that of course everybody – and I mean everybody – had to congratulate Ambassador Amano, who disclosed that it was the big 6-0 no less, and things began to get pretty repetitive. If only Ambassador Henrik Salander of Sweden had been there with his guitar, we could have all burst into song as happened a few years back. A breathy Marilyn Monroe would have just put the icing on any cake she had popped out of – and given the mood swings of the last couple of days, I have a feeling that few would have been too surprised. For me the highlight of the day was the lunchtime panel held by the Global Security Institute and the Government of Sweden on the connections between preventing the weaponization of space and nuclear non-proliferation and disarmament. Apart from yours truly, the other speakers were Dr Hans Blix (see my “On the Ropes” posting from 8 May) and Ambassador Robert Grey, former US Ambassador to the Conference on Disarmament in Geneva. Both were excellent speakers, who brought quite different perspectives to the topic. Hans was, as ever, forthright and focused on the big picture. Bob (who had earlier spoken at UNIDIR’s seminar on the CTBT on Monday) was hard-hitting, critical of his own government, yet tempering his hope for the future with reality. It is certainly the season for anniversaries. At the panel presentation, we marked the 40th anniversary of the Outer Space Treaty and the 50th anniversary of the first satellite in orbit, Sputnik. In Vienna, the International Atomic Energy Agency (IAEA) is celebrating its 50th and the Comprehensive nuclear Test Ban Treaty (CTBT) provisional secretariat its 10th. In Den Hague the Organisation for the Prohibition of Chemical Weapons (OPCW) is also celebrating its 10th year of operation. Disarmament Insight note: we promise, no more maritime references will be allowed on this blog for the rest of the month. Webcasted video interviews with Patricia and other participants in the NPT meeting are available online at: http://www.BanningTheBomb.tv. In the warm afterglow of the decision to adopt the agenda, the States Parties to the nuclear Non-Proliferation Treaty (NPT) got quickly down to the business of reviewing the Treaty and preparing for 2010. Yesterday afternoon was allocated to discussion of Cluster 1 issues, namely implementation of the provisions of the Treaty relating to: non-proliferation of nuclear weapons, disarmament and international peace and security; NPT articles I and II and preambular paragraphs 1 to 3, Article VI and preambular paragraphs 8 to 12, and security assurances. There was a scramble for speaking slots. This will undoubtedly be the recurring complaint as we try to squeeze in 10 days work into three and half – a bit like going clothes shopping after holiday eating. Tomorrow morning will be dedicated to the specific issues of nuclear disarmament and security assurances; a little spillover into tomorrow will not be noticeable. More verbal overspill however will make listening uncomfortable in the conference room as speakers either speak for too long or speak at too fast a pace in order to get through their points in record time. Having said that, there were ten minutes left at the end of yesterday for interactive debate – an opportunity taken up by Canada and Germany. Not long enough but at least something. One key feature of the this NPT meeting is that the New Agenda Coalition (NAC) of Brazil, Egypt, Ireland, Mexico, New Zealand, South Africa and Sweden are once again cohesive and active. On behalf of the NAC, Ambassador Paul Kavanagh of Ireland characterized the task for review cycle to identify particular aspects on which incremental progress can be made with a view to advancing the objective of a nuclear weapon free world. (A link to the NAC working paper is included below). The US, France, the UK and China all spoke in the afternoon session, all – as we well know – committed to nuclear disarmament (and singing their own praises on how much they have achieved). As mentioned in Disarmament Insight’s blog posting of 8 May, the US has produced a whole set of papers that they circulated in advance of the NPT preparatory meeting (link below), part of a new approach to engage and enhance dialogue. The US has confirmed its commitment to nuclear disarmament and refers frequently to “our shared vision for a nuclear weapons free-world”. The papers produced by the US are detailed, informative and engaging. Not everyone will agree with everything in them, of course, but why should they? Indeed, we need to set out our views and interests so that others can engage in debate. The US is to be applauded for the effort and for their openness. They’re worth a read and, if you’re so moved, you can respond to their challenges by commenting on this post. Walking into an NPT conference is always a bit of a surreal experience. Here in Vienna we have governmental and non-governmental representatives from over 180 countries sipping exceedingly stimulating coffee and debating the not-so-finer details of nuclear disarmament and non-proliferation. Except that, until now, they haven’t been. The conference to prepare for the 2010 nuclear Non-Proliferation Treaty Review Conference began over a week ago and still they have yet to adopt an agenda. So out of a ten day meeting, we are on day seven with no substantive discussion. This is reminiscent of what happened at the Review Conference in 2005 when Egypt, the US and France, along with a number of other states were locked in battle over how to characterise recent review meetings in the agenda. This year it has been Iran. And only Iran. The US and Egypt are basking in the praise for their restraint and having put their differences behind them – at least for now and of course only on the decision of the agenda. So the big question at this meeting has been: will we even get started? And I can now answer that question at last with an alleluia, shout of proclamation, yes!! "The meeting decides that it understands the reference in the agenda to 'reaffirming the need for full compliance with the Treaty' to mean that it will consider compliance with all the provisions of the Treaty". Following a long statement in which Iran made critical comments regarding the Chair’s conduct of consultations (Ambassador Amano responded in a dignified manner, thus not letting such criticism pass), Iran has just accepted the constructive fix this morning in a “display of goodwill and flexibility”. The fix will be in the form of an asterisk noting the South African-proposed text as a footnote to agenda item six (that deals with the substantive agenda including the phrase on reaffirming the need for full compliance with the Treaty). The agenda was therefore adopted at 11.40am and substantive work can now begin officially. But why was all this happening? After all, Iran has received the censure and disapproval of the international community through Security Council resolutions and through the IAEA Board of Governors reports. Why should they be worrying about a mild slap on the wrist contained within a chairman’s summary at a preparatory meeting of the NPT? Why would they isolate themselves in this way and prevent substantive work and development of the Treaty? A number of explanations have been mooted by varying shades of political opinion and over the next few days in the margins of the official work that will now begin, I may be able to test them out against the evidence. So now, from the Austria Conference Centre: onwards and sideways! BBC Radio Four (Intelligent Speech is how the Beeb modestly describes it) has some of the best radio programmes in the English-speaking world. Many will be familiar with the BBC World Service. But unless you’ve lived in the numerous isles off just of the west European coast, chances are that you will not quite understand how addictive the station is. From aficionados of Women’s Hour to eccentric fans of Mornington Crescent and Just a Minute, Radio Four listeners are a peculiarly well-read, well informed group of obsessives. (I should here, I suppose - if I have to - give the The Archers addicts a mention. But they’re a very strange lot and are probably right now listening to one of the twice-repeated daily episodes dedicated to the sleepy, fictitious farming town of Ambridge and its drama-queen inhabitants). It was to just such an erudite public audience that Dr Hans Blix, former Director-General of the International Atomic Energy Agency (IAEA) and former Chairman of the UN Monitoring, Verification and Inspection Commission in Iraq bared his soul. On the Ropes is a half-hour interview slot in which journalist John Humphreys interviews famous people about a difficult time in their lives, in which they have had to endure stormy weather. Dr Blix was asked tough questions about the time leading up to the 2003 invasion of Iraq. No doubt all reading this will remember how Dr Blix, along with Dr ElBaradei of the IAEA, regularly faced the Security Council to give accounts of the progress that UN inspectors were making in the search for weapons of mass destruction (WMD) in Iraq. In the On the Ropes interview we learned of Dr Blix’s dawning realization that there were no major stocks of biological weapons in Iraq, or any other type of WMD for that matter. He was also increasingly uncomfortably aware that this understanding was not going to be able to stop the war. He talked also in the interview about Dr David Kelly, the British bioweapons inspector who died soon after the invasion. The interview is thought-provoking, honest and, at times, moving. It’s a fascinating account of how one man – Blix – with the knowledge was also powerless to stop the war, despite being able to tell the facts openly and honestly. Something this Swedish lawyer is still determined to do. I recommend you take the time to listen to On the Ropes and – who knows? – you may become as addicted to Radio Four as the rest of us. Patricia is Director of UNIDIR. Last week, members of the Nuclear Non-Proliferation Treaty (NPT) gathered in Vienna for a two week meeting to consider the health of the regime. It's the first of three preparatory meetings leading up to the NPT's next formal review in 2010. The NPT has 188 members, almost every country in the world. Conspicuously, though, nuclear-armed India, Israel and Pakistan are not parties. And North Korea says it has withdrawn. There are two official categories of member in the NPT. There are five designated nuclear weapon states (Britain, China, France, Russia - originally the Soviet Union when the treaty was negotiated in the late 1960s - and the United States) and the rest are non-nuclear weapon states. The bargain was basically that non-nuclear weapon states would agree not to make nuclear weapons but could have access to nuclear technology for peaceful uses. The nuclear weapon states would eventually disarm, phasing out their deadly nuclear arsenals. North Korea's behaviour over the last few years has created challenges for the NPT, especially its nuclear test in late 2006 after deciding to leave the regime. Another reason for crisis is Iran's bid to enrich uranium in defiance of U.N. resolutions demanding that it halt. Iran says it sees no reason to stop doing what it sees as its legitimate right. The situation, and the reasons for the NPTs problems, also go deeper. For instance, the NPT was originally envisaged for a duration of 30 years. But in the middle of the 1990s NPT members agreed to extend it indefinitely. Since then, progress on nuclear disarmament has been disappointing to most NPT members. Feelings of resentment and injustice have grown about the indefinite extension bargain: some non-nuclear armed Non-Aligned countries even grumble that they were cheated. So, North Korea and Iranian challenges aside, the atmosphere in the NPT is not especially healthy anyway. Despite the looming challenges the global nuclear non-proliferation regime faces, the treaty's last five-year review conference in New York in 2005 resulted in nothing. The first two weeks of that meeting were spent in procedural wrangling, and at the end of the third week not even a final report had been produced, let alone recommendations to maintain and strengthen the regime. It must be with an ominous feeling of déjà vu this weekend that, halfway through the Vienna preparatory meeting, diplomatic negotiators are again mulling over their inability to achieve an agreed agenda in the NPT. The first preparatory meeting in each five year NPT cycle is traditionally the one in which the most substantive discussion and deepest discussion happens. Indeed, many useful contributions to the discussion have been announced by states, including several papers by the United States, the most powerful nuclear weapon state. These opportunities for substantive work should be embraced. However, so far, half of the preparatory meeting's assigned time has already been wasted without an opportunity to discuss the relative weaknesses and merits of the various papers and proposals put forward. Iran disputes language about compliance in the meeting draft documents it believes is a further attempt directed at isolating and coercing it. So, despite placatory efforts by the meeting's chair (Japan), Iran is blocking a consensus unless it is changed. The preparatory meeting only has one week left, and signs aren't good that the NPT's rules and the positions of various states will let it achieve much. Here we go again? Let's hope not. The NPT has so often been described as the "cornerstone" of nuclear non-proliferation efforts that it's become a cliché. But it's true, however imperfect it's perceived to be as a grand bargain. Posturing aside, it's in the interests of the whole international community to move ahead on steps to address the challenges to nuclear non-proliferation, along with sufficient attention to examining and tackling their causes. On Friday came news that South Africa, a heavy hitter in nuclear disarmament and a prominent member of the Non-Aligned, has proposed a compromise. This might just let a deal come together over the weekend in time for the second week of the meeting. Let's hope interests prevail over positions. Excellent day-by-day summaries from the Vienna NPT meeting are available from the Acronym Institute website (www.acronym.org.uk). You can also read a chapter analysing multilateral negotiations by their author, Dr. Rebecca Johnson, in our third volume of work by clicking on the picture of the pink book at the top of the left column. The U.S. documents mentioned can be found at the State Department website: http://www.state.gov/t/isn/wmd/nnp/c21893.htm. See also Reuters, "Iran, N. Korea cast shadow on nuclear treaty meeting"
On 17 April, for the first time ever, the United Nations Security Council (UNSC) debated the relationship between “Energy, Security and Climate”, based on a concept paper put forward by the United Kingdom. In introducing these themes into the Security Council, the UK reportedly faced opposition from China, Russia, the United States and some developing countries via the Group of 77. These states apparently objected on grounds that global warming isn’t a matter of international peace and security. Some accused the Security Council of “ever-increasing encroachment” on the role and responsibility of other UN organs. Such concerns have been heard before in other contexts whenever the UNSC has shifted its gaze (think terrorism or initial controversy about UNSC resolution 1540 on weapons of mass destruction). It still leaves the big question: is global warming likely to increase the probability of war? Media reporting on the debate indicates that controversy over discussing these issues in the UN’s premier security forum meant that, not for the first time, UNSC deliberations have generated more heat than light (no pun intended). Some studies, meanwhile, indicate that rich nations in the temperate north may escape or even benefit from the effects of warming, which is widely blamed on their use of fossil fuel. Not only would this be a very cruel irony. It also heightens suspicions that industrialized countries, whose interests are well represented in the UNSC, will use the body to try to impose self-serving measures on other poorer nations, in the process impeding their development. Matters seem a very long way from that. Meanwhile, the discussion is at least a start in attempting dialogue about the links between climate, energy and security. And the UK’s concept paper underlines the need for new approaches to achieving and maintaining security that better respond to global interconnection in more productive ways. Viewed from outside, fractious and ideological politics in the Security Council just highlight the limits of security perceptions based on Cold War certainties, and must seem a million miles away from the looming problems of human insecurity faced by ordinary Sri Lankans, Bangladeshis, Pacific Islanders and others because of the consequences of climate change on their lives. Maybe it’s time to ask how their perspectives can be brought into the process in order to keep it real, rather than rhetorical.